There are some of us that for whatever reason have multiple Twitter accounts. There's a personal account, a work account, another work account, that mock Han Solo account you've been running on the side, and whatever else you've got going on. Keeping track of all of them can be a pain, and that's where Sleet's multi-paned Twitter interface can come in handy. 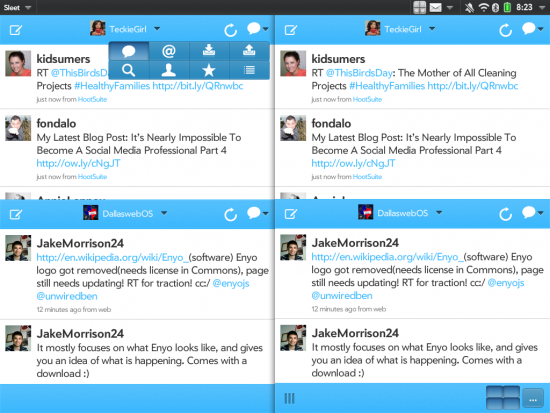 Think of it as the old Twitter standby Tweetdeck, but for your TouchPad instead. For those not familiar with Tweetdeck, it allows you not only to view multiple Twitter accounts at once, but also multiple feeds (mainline, mentions, etc) within those accounts at the same time. 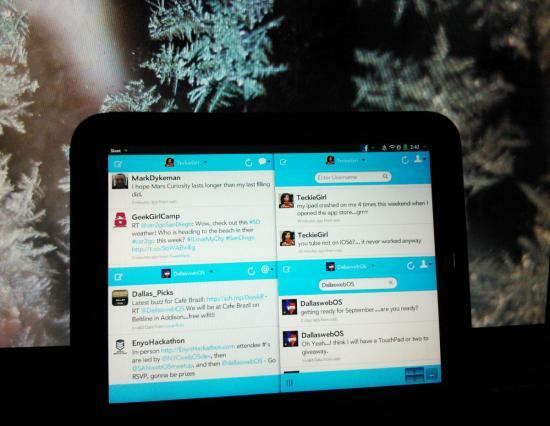 Sleet is the first dedicated Twitter app for webOS that gives you the ability to have up to four - yes, four - Twitter accounts going at the same time. Obviously, you have to log into each separately, but once you have you'll be able to mix, match, and tweet to your heart's content. The basic interface for Sleet is one of four panes arranged in a two-by-two grid. Each pane's center is occupied by the feed displayed, which is selected by a combination of the account at the top center and the feed in the top right. New tweets are composed from the top left of each pane. As for what all the panes can display, if you're familiar with Glimpse's Twitter widget then Sleet will definitely feel familiar. That's because Sleet is for all intents and purposes a repurposing and repackaging of that widget into a Twitter-specific app. The panes can display all of the necessary Twitter feed features, including your main feed, mentions, your direct messages inbox and outbox, search, user search, favorites, and lists. Sleet also has notifications, though unfortunately they aren't push (though you can customize how often the app pings Twitter's servers). At the outset of this review we described a Twitter power user, the one with multiple accounts. But Sleet can be for the single-account user too. You can open the same account in multiple panes, having one pane display your main feed and another your mentions and the other two your direct message inbox and outbox. Or if you're into Twitter's list feature you can open multiple lists across the panes. Sleet's traditional customization options are pretty standard, including font size, image upload service, read later services, and whether links should open in the in-app pop-up browser or the default TouchPad browser. The app doesn't have support for theming, and while the light blue and white color scheme works for the Sleet name, we wouldn't mind having the option to turn down the lights like you can in Glimpse. Sleet's non-traditional customization is its strength. 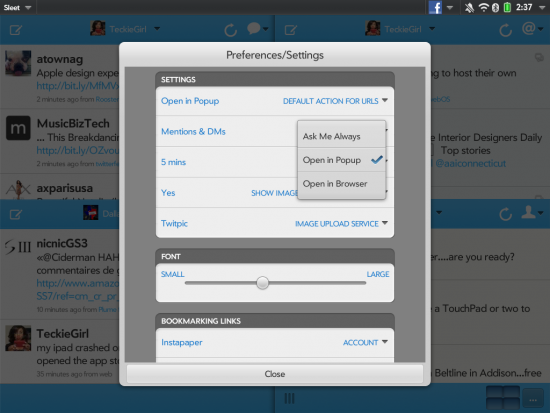 Apart from the previously-discussed pick-a-feed options for each pane, you can also adjust the layout of the panes. The default is the two-by-two grid, but you can also choose from options like two full-height columns or a tall column paired with two stacked panes. Sleet lets you tailor the app to suit your Twitter needs, be it just your feed and mentions from a single account to feeds from four separate accounts. It's all up to you. For those turned off by the price of Glimpse but intruigued by the multi-pane action the app offered for Twitter use, Sleet might be the app you've been waiting for. At just $0.99, Sleet doesn't even begin to approach that vague psychological threshold where an app becomes expensive. The app is full-featured, with everything from customizable panes to notifications and will serve Twiter power users of the single and multi-account variety with equal success. Our only real complaint would be the basic chunky stylings of Sleet, but for the functionality it provides we're more than willing to put up with its looks.